Belspur Oaks Pet Crematory has been serving the Veterinary and Pet Community by providing dignified after-care services that include Pet Cremations, Pet Funerals, Grief Resources and our Sneaker's Ark Pet Loss Support Group, and a variety of Personalized Memorial Products. For over 29 years we have been servicing the Gulf Coast of Florida. We are well known in the community for providing excellent service and compassion during your time of need. 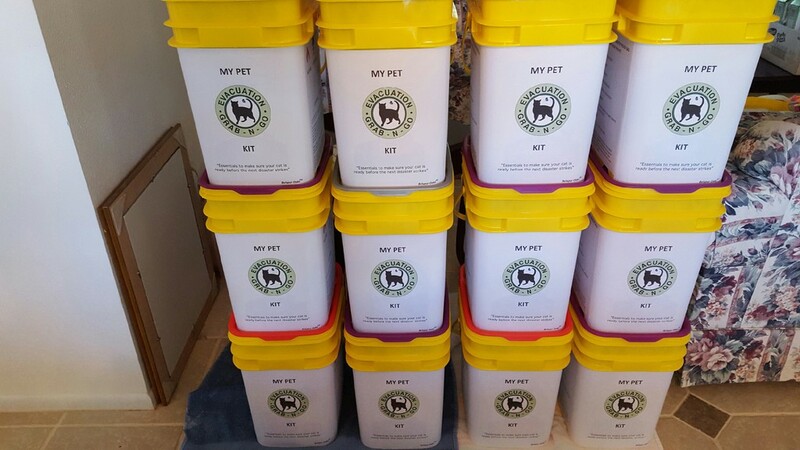 95% of the area veterinarians use us as their preferred cremation service provider. 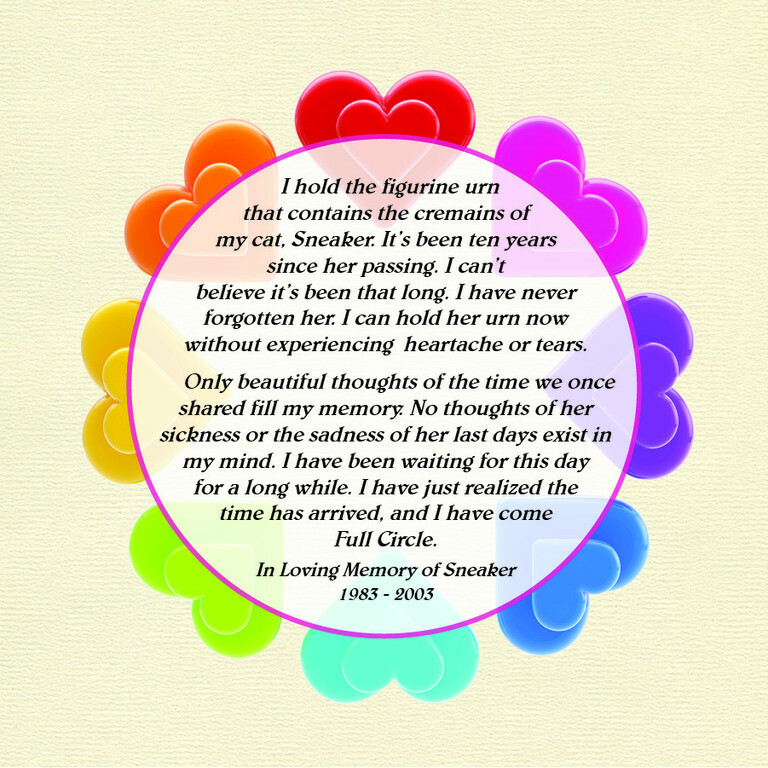 "Coming Full Circle" was created by Barbara with the vision of serving as a therapeutic resource for those who have experienced or are about to endure the loss of a beloved pet. Every one of the articles featured in this collection have been written by her and previously published in Sarasota Pet & Manatee Pet magazines. As the owner of her own pet crematory and because of her involvement with Bentley's House, Barbara has been afforded many uniqe opportunites to experience firsthand the emotional effects and grief associated with losing a beloved pet, giving her an empathetic ability to help grieving pet owners navigate through one of life's most heartbreaking events. It is with great excitement that Barbara announce that her labor of love is now complete and ready for purchase. Through the years, in helping thousands of grieving pet owners say their final good-byes to their beloved pets, Barbara noticed that the same questions always seem to be asked: "Do you have pets of your own?" and "Have you ever experienced the passing of a beloved and cherished pet?" 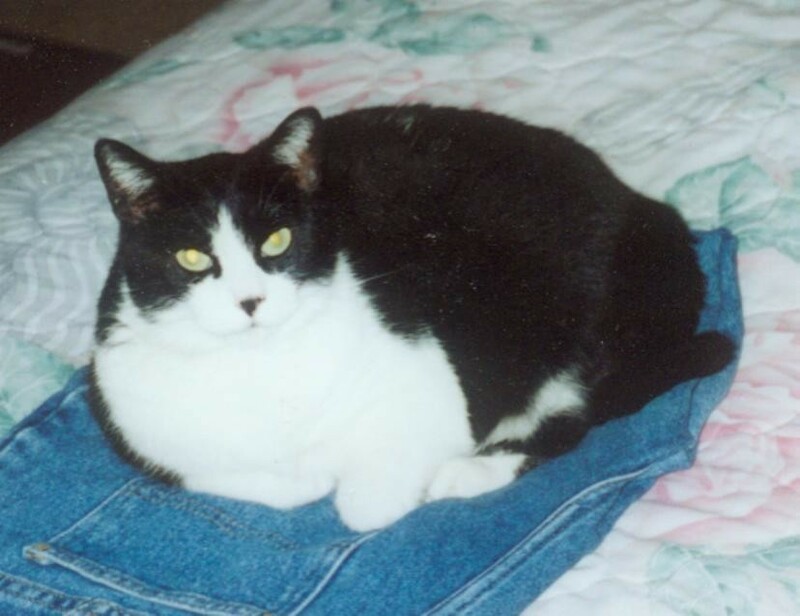 The answer is a resounding "Yes," and in a final tribute to her own cat, Sneaker, with whom the author shared a relationship that spanned more than 20 years, Barbara chronicles the memory of her pet's life in a heartwarming storybook titled Sneaker and Me. Now available, this beautifully illustrated, sweet tale takes the reader along on a humorous and, at times, moving journey through significant life events, beginning with the successful adoption of a black shelter cat and culminating with Sneaker crossing the Rainbow Bridge. The theme of the story also emphasizes that responsible pet ownership lasts for the life of the pet. This year, I had many empty, plastic Tidy Cats litter containers that I had been saving for no apparent reason. Not wanting to toss them into the recycling bin, I thought that there must be a good way to reuse them. I tried to imagine all the different things that could possible be collected and stored in the container for safekeeping. 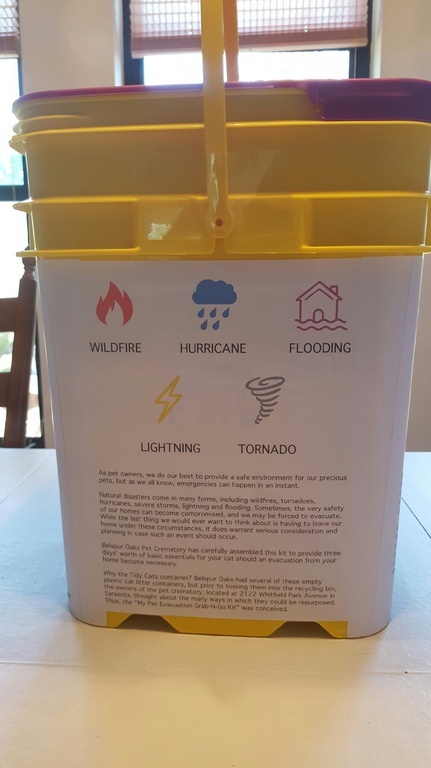 And as I continued to contemplate, it finally clicked-why don't I use these containers to store hurricane preparedness items for pets and then donate them to local pet families in need? So, after considering the many ways in which the containers could be repurposed...voila! 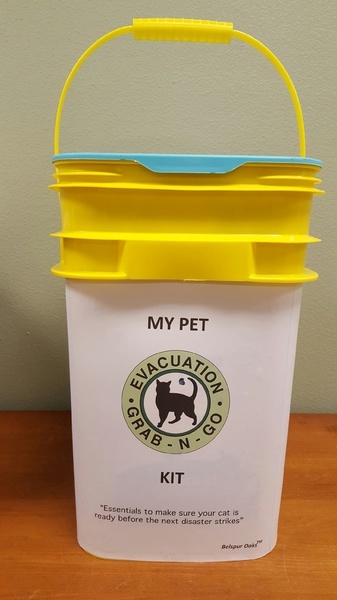 The "My Pet Evacuation Grab-N-Go Kit" was conceived. 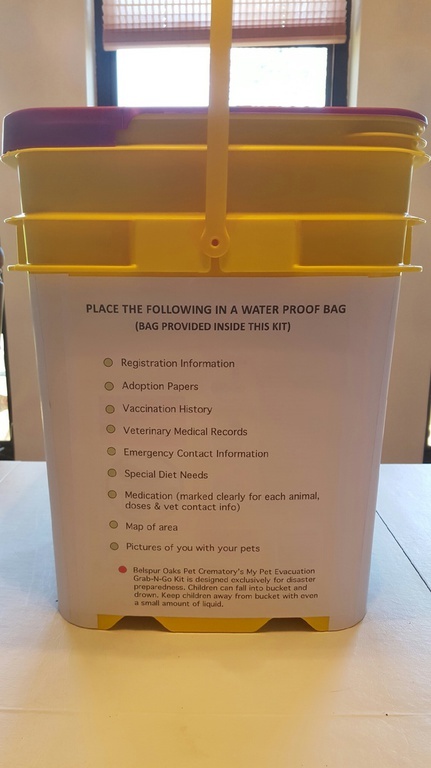 I assembled the kits to provide three days' worth of basic essentials for a pet should an evacuation from the pet owner's home become necessary. Each kit is fairly lightweight(approximately 9.4 pounds), easy to carry and waterproof. I decided to dontate every kit to Rhys Miller, founder of Fairy Tail Endings, Inc., who, in turn, will distribute them to pet families in need this summer during one of the wellness clinics offered through TCI Suncoast Trinity Charities. Fairy Tail Endings, Inc. is a local 501(c)(3) nonprofit organization that helps qualifying pet owners in Sarasota and Manatee counties receive necessary treatment for their animals when families are facing financial struggles. Founded several years ago, the organization is committed to keeping wanted pets with their loved ones. 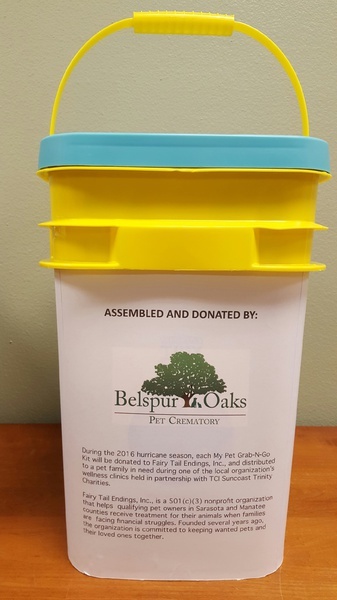 "My Pet Evacuation Grab-N-Go Kit"
Belspur Oaks Pet Crematory is pleased to announce that we have completed our move to our new Pet Memorial and Cremation Center. Please read our article about our facility. We grieve immensely over the death of a pet. This reaction is only natural. Our feelings towards our pets are so special that experts have a term for the relationship: The human companion animal bond. When this bond is severed, the sense of loss can be overwhelming. That is why Belspur Oaks Pet Crematory was created in 1988 to help you and your family with the loss of your pet. Society does not offer a grieving pet owner a great deal of sympathy. Even a close friend may comment, "It's only a dog. You can always get another." Such reactions would however be heartless given the loss of a human friend or family member, and it is generally recognized that a person who has experienced such loss needs the support of friends and relatives. Psychologists now acknowledge that we need much support - but get far less - with the loss of a companion animal. The entire staff of Belspur Oaks Pet Crematory would to take this opportunity to extend to you our deepest sympathy for the loss of your loved and cherished companion. Belspur Oaks Pet Crematory is here for you and your beloved and cherished pet. As the business owners, we currently have two cats, "Trinket" and "Woobie", and others that have passed on. 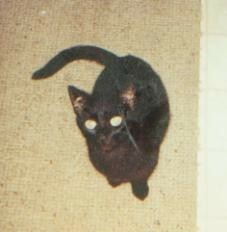 In the summer of 2003, we lost our beloved cat "Sneaker", at the age of 22. We had her for 20 years. She was a shelter cat that we adopted from the Sarasota Humane Society. "Sneaker" is missed every day and we dedicate this site and business to her. We also have lost "Cuddles" at the age of 16. She was born in our porch cabinet. She was our daughter's cat. We understand what you may go through when you lose your pet. We are here to help you and will continue to do so for many years to come. If we can't help you, we will find someone who can. We also have lots of resources available from books to pet loss support groups.